Watching cooking shows for hours on end usually has me sprinting to put on my apron as is, however, Bake Off has me aching for baking more than usual. I watch the contestants tackle each challenge salivating at how ridiculously good everything looks. With every signature bake (the contestants must make a pastry that represents them) I'm wracking my brain for what my own entry might look like. I want to walk around covered head to toe in flour. I have a need to knead. You get what I'm saying. 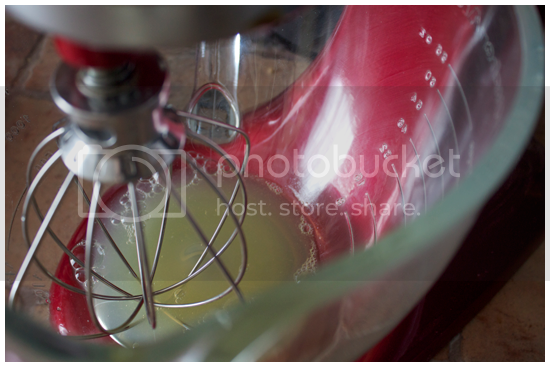 HOWEVER, there is a problem with the need to bake things constantly-- and that problem looks exactly like the purple chiffon bridesmaids dress I picked up from the shipping people today for my dear friends wedding next month. See, it fits. It just fits. If I bake anything, there is no way I'm not tasting as I go ("product quality testing," we call it in the business") and no way I'm not at least trying the finished product. How then, to keep up a food blog, satisfy my tastebuds and my baking urges, without going overboard and finding myself sucking in for all of the wedding photos? 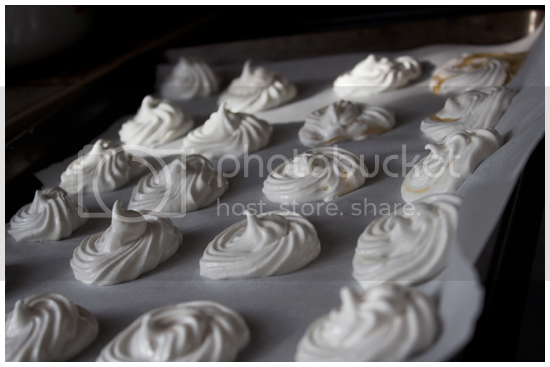 Basic Meringues-- technically challenging (slightly), egg whites (healthy), crunchy on the outside, soft on the inside texture (tasty). 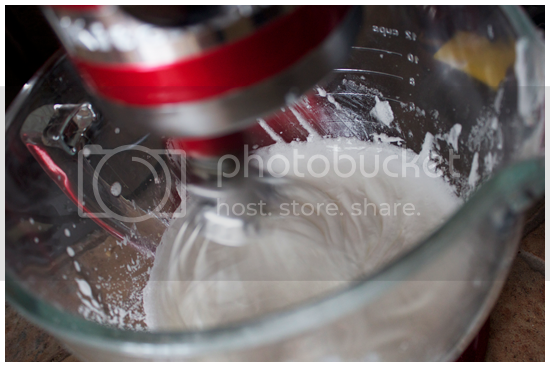 Makes....a lot of meringues, depending on how large you make them. 1. Preheat your oven to 200 degrees, and line two cookie sheets with parchment paper. 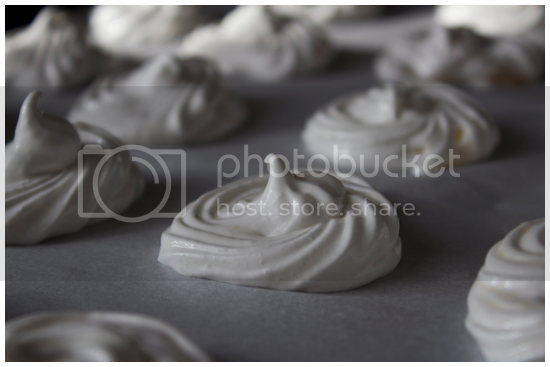 First rule of meringues is NEVER make them in plastic bowls. The ability of the egg whites to whip up is completely ruined if even a single drop of fat-- oil, butter, whatever, gets into them. So, use a glass bowl, wash it well. Some people even wipe their bowl clean with lemon juice or vinegar before starting. With your bowl prepped, add your egg whites. Whip them on a medium speed until frothy. 2. Once the whites have become slightly bubbly and white, add the lemon juice and whip until soft peaks form on medium-high. Lemon juice is an acid which will help the egg whites form and fluff-- vinegar or cream of tartar will also do the trick. They will start to look like they do below. 4. When you have stiff peaks, add the vanilla and whip until thoroughly combined. 6. 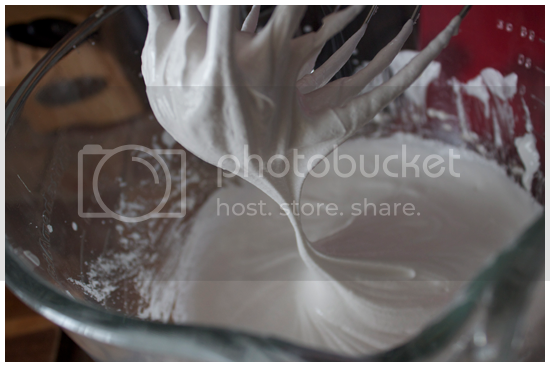 Bake the meringues for 1 hour. Then, turn the oven off leave them in there for at LEAST another hour, to dry out the centres. Some people leave their meringues in overnight. I am nowhere near that patient. Enjoy!